Lynnea Louison is a Senior Director, overseeing the strategic and day-to-day leadership of IAALS and its administrative functions. 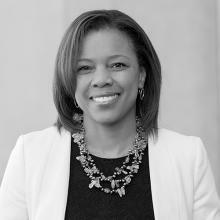 Prior to joining IAALS, Lynnea served for over five years as the Director of Operations at the Boettcher Foundation, overseeing human resources, IT, event planning, facilities, and project management. Before joining Boettcher, Lynnea was the Director of Human Resources at Tony’s Market, a large locally and family-owned business in the Denver area. Lynnea received her master’s degree in Business Administration from the University of Denver’s Emerging Leaders MBA Program, and her bachelor’s degree from Pennsylvania State University, majoring in Psychology and Spanish. In her spare time, Lynnea likes salsa dancing, enjoys gourmet food (both eating at restaurants and home cooking) and running for fun or in local races. She also loves to play and watch all kinds of sports, including football, golf, and skiing with her significant other, David, and her son, Miles.